Odo is to accompany Tom on this quest, but Margot insists on joining him. Fearless, in his roguish idiom, says, "I'm sorry if they've got a mess here, but it's not my problem." Margot counters that he has "no guts," which is sufficient to add Fearless to the party. Then Odo reveals a fifth companion, a creature named Drobni, who is of a large humanoid race called the Dreddet. Once an aggressive species who caused mischief, the Dreddet were rendered harmless by the Master when he took away all of their thumbs. "They are simple folk now," Odo explains. The next day they depart the Master's island by boat, unarmed, though Odo brings with him some "medicines and balms and potions." Their first stop is the fishing village of Swumly. Tom, Fearless, and Margot masquerade as young Dreddets, and thus Odo instructs them to "hide your hands and simplify your faces, dull your eyes." They stop by the stables to procure horses, but while they are there, a monster painting on the side of a wagon comes to life. A servant of the Nightking, this bird-like creature with a scorpion tail and a cobra head is called a dagathorpe. Its gaze alone causes one of the stableboys to spontaneously combust, and spurs Odo to hasten the party to an underground Dwarf kingdom for subterranean passage to the Nightking's realm. As the party traverses this underworld, they encounter a fright house of challenges. At one point, when they must choose between multiple paths, Odo instructs Tom to "put yourself in the Onelord's hands," and Tom mystically intuits the right way. They meet the flying piranha-like stekkers-which fortunately eat only one another-then are pursued by a vicious creature with the head of a dugong and the body of a sea elephant, and finally encounter a floor coated with bagguts, a sort of leech. When Fearless accidentally sticks his hand on them, Odo heals it with an application of Keoghtom's Ointment: one of the few direct appropriations from D&D rules in the film. After a cave-in, and a few tense moments of Tom's claustrophobia in pitch darkness, they find a tiny crevice and a way into a glittering cave of gems. 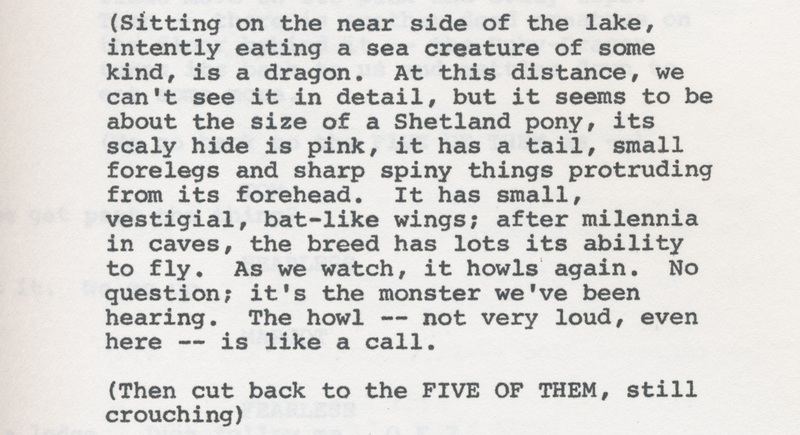 In this cave they encounter a ruby dragon, though it is only "the size of a Shetland pony," and it bears on its forehead a sort of carbuncle's gem, "a glowing blood-red ruby the size of hen's egg." The ruby, Odo explains, "is its soul, its mind and spirit," and that "to possess one brings great power" should you be able to "pluck the ruby from its forehead." While the party makes elaborate plans to sneak around this creature, they unfortunately awaken its far larger mother. Tom then leaps onto the young dragon's back and removes the gem, which instantly subdues it. As the party flees, the mother elects to nurture her wounded offspring rather than seek revenge. Tom pockets the ruby.